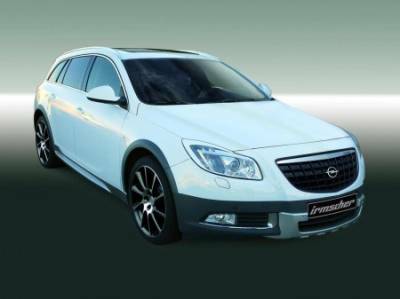 Irmscher tuning studio has released official pictures of the conceptual development of Opel Insignia ST Crossfour, which will be presented at an international exhibition in Geneva in March. The standard version of the car to compete with such models as the Audi A4 Allroad, Volvo XC70, Peugeot 508 RXH, VW Passat Alltrack and others. Apparently, the revised specialist Irmscher innovation is more likely to be the choice of the buyer. Opel Insignia ST Crossfour Irmscher got a new kit, which not only improves the look of the car esteticheny, but also helps the body to protect it from damage. A list of changes includes spoiler, new grille, wheels, sports brakes, lower suspension than the original Insignia ST. What will be installed under the hood, is unknown. However, it is assumed that we will see a 2.0-liter diesel engine with a capacity of 165 and 195 hp Their work will be carried out with 6-speed manual or automatic transmission.